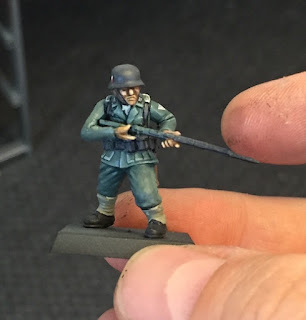 I finished the last batch of German soldiers this afternoon. I'll take close up photos once I have bases on them. For now, it is just nice seeing them all together as a platoon. I am hoping that between this box, and the Pioneer box, that I don't need to paint any more German infantry. When the vehicles for this force are completed I should have enough models to play a wide variety of games. This platoon will play far differently than my early war platoon given the inclusion of assault rifles and panzerfausts. I began painting this platoon for another one of our Big Bolt Action Games, but I had forgotten about a mini-camping trip my wife had planned. Given that, there is no need to paint at blistering speed. 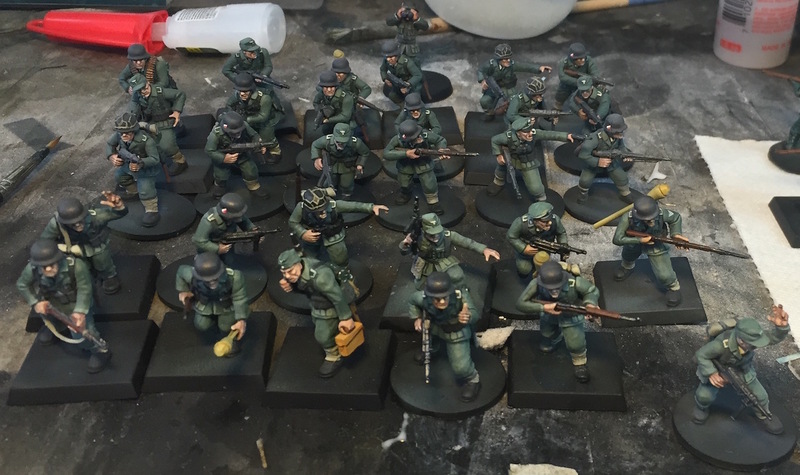 I can slow down and take my time with the last batch of germans to the right of the completed bunch. However on the off chance it rains this weekend, I think might press on, and completed the army. It would be nice to have a new force for Historicon. How shall I base these guys? Should I go damp earth with fall colored fallen leaves? Should I bases them on wet mud? Should I try to make ruined city bases for them. That would lighten the base providing contrast, as well as allow me to add little splashes of urban debris such as as bricks and wood. I suppose a basing bake off is in the making. I usually paint a test mini before I dive right in lay down paint on 60+ miniatures, however today I jumped. 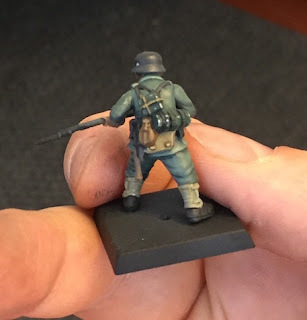 The fun part after the jump, was figuring out how to add depth and highlights to the Vallejo German Uniform base coat. Enter Secret Weapon Storm Cloud wash. The coverage was good, the tint was good, and I am very happy with the result. 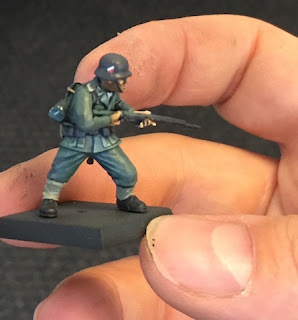 It is fast and easy, and will allow me to rapidly paint up a late war force for our gaming group to experiment with.